Single / Single / T-Single pickup layout—SC1, SC1, TF3, respectively—and they sound so, so remarkably good—and yet they are all hum-cancelling. 5-Way Switch that delivers the customary 5 sounds you would expect from a 3 single coil pickup layout. 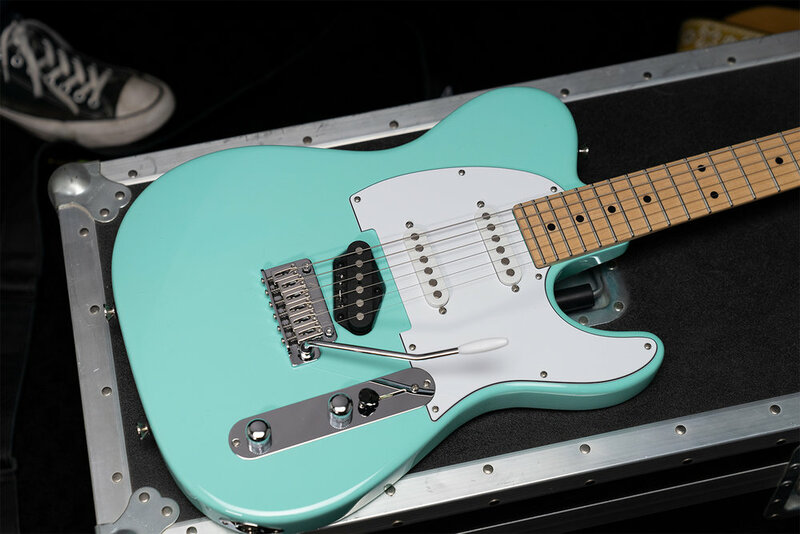 But…with a pull up on the Tone Control it also easily employs the additional sounds of Neck + Bridge and Neck + Middle + Bridge pickup combinations—for a total of 7 useful tones. Just a pull up adds the bridge pickup to either the Neck or Neck and Middle pickup settings. We call this feature: Add Bridge. And the best part, it plays like an Anderson—best playing and best sounding guitars in the entire solar system. So where or where did this T-Classic go? Welcome to Five Star Guitars in the Pacific Northwest—Beaverton Oregon to be exact—the home of Nike and…other things that we are not suppose to mention in public. What? Come on and tell us what things not to mention in public. We won’t mention them either. Well...maybe about why there appears to be a rather large foot—wearing a Converse sneaker (also made by Nike)—in the background of one of these photos of this magnificent, T-Classic finished in Surf Green. It is a rather big foot, don’t you think? A really big foot - appearing right behind this most-amazing vintage T-style guitar. But the presence of a big foot in a picture of a guitar in Oregon doesn’t really, necessarily, probably, perhaps, maybe indicate that there is anything of a super-mysterious cryptozoological nature going on here—or does it? Let’s all call Ed at Five Star Guitars, in Oregon and ask him, what’s up with the world’s best guitar and the big foot? (503) 439-9500. Editor’s Note: No guitars were harmed by road cases during the shooting of this Guitar Tales feature—but of course.